The capital city of Navarra, Pamplona is perhaps most closely associated with its legendary San Fermin Festival, which features the raging Running of the Bulls in the second week of July. Bringing your Pamplona motorhome rental or campervan hire during this period will spare you the inconvenience of scouting for hard-to-find accommodation while yours can easily be parked at a camp a half-hour away from the city where you can gear up for – or simply watch from a safe distance – the festivities. 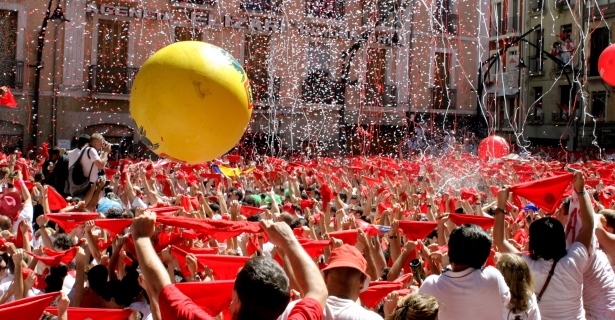 Outside the adrenaline rush of the ‘encierro,’ Pamplona offers a historic town as once the camp of Roman general Pompey, with walkable streets, lush parks, excellent food and generally amiable atmosphere a world away from the madness that is Sanfermines. From Pamplona, make your way out of the capital and into the Pyrenees of Navarra. The villages that nestle in the mountains are quintessentially Basque, so a trip on a Pamplona campervan hire close to the border with France will afford you a glimpse into the local culture and heritage. If you continue on beyond the border and you are craving for some waves, the resort town of Biarritz on the French side of the Bay of Biscay makes a great first stop. You can follow the Atlantic Ocean on the Aquitaine coast and drive your Pamplona motorhome rental to Bordeaux, world-renowned for the wine of the same name. The chateaux of Saint Emilion and The Medoc are a little more than three hours away by campervan hire or RV rentals. What makes Pamplona a strategic staging post is its central location to the more popular destinations within Spain. A drive east on your campervan hire in Pamplona will bring you first to Aragon, the historic center of what was then the Crown of Aragon in medieval Spain. Beyond history, Aragon tempts the outdoor enthusiast with lodes of activities like canyoning, rock climbing, hydro-speeding, whitewater-rafting and cycling. Beyond that is the region of Catalonia, with Barcelona at its commercial and cultural center. For a mere distance of four hours by motorhome rental in Pamplona, you will get to look up at the Gaudi masterpiece, La Sagrada Familia, among many of Antoni Gaudi’s creations. Alternatively, you can drive your campervan hire in Pamplona west to the autonomous Basque Country for Bilbao’s Guggenheim Museum, the beaches of Zumaia and Zarauz, and the cream of the sea crop at Getaria. You can then drive down south to central Spain and the capital, Madrid, just four hours away by RV rental in Pamplona. There’s a trove of museums, galleries, restaurants, bars, shopping centers and leafy parks to be found here, along with a generous helping of tapas and sangria while watching the sultry stomping of flamenco. Football fanatics make the mandatory attendance at the Bernabeu Stadium to catch the Real Madrid in a match or practice. For another spectator sport, the Las Ventas bullring was where the ‘torero’ first hoisted the inciting red cape.